One of the marks of our modern culture is the proliferation of gadgets most of us carry around. From digital cameras to cell phones to tablet computers to laptops to MP3 players, we have our hands full just trying to keep track of all of them. This excellent concept could go a long way toward streamlining our technology while still keeping us as connected as always. One of the problems with having too many different pieces of technology is the fact that hardware and functions are often repeated between the devices. Your digital camera and cellular phone both take pictures; your tablet and MP3 player both play videos; your phone and laptop both store your data. 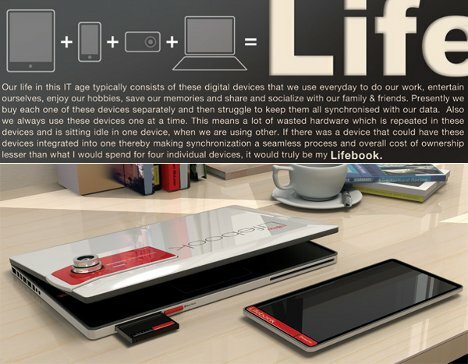 The Lifebook concept could solve several of our modern first-world gadget problems. According to designer Prashant Chandra, combining all of our gadgets would make life simpler and allow all of our technology to share resources. 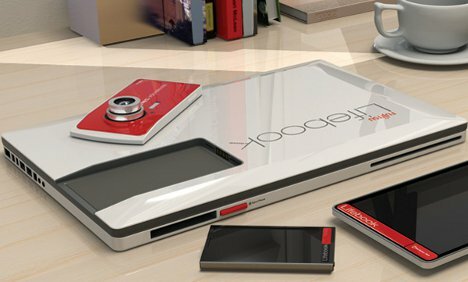 Rather than having the same bits of data stored on multiple devices, Lifebook would let each device form part of an overall super-gadget. It’s sort of like Voltron – but instead of being composed of vehicles, it’s made up of a tablet, a camera, a phone/music player and a laptop. The laptop serves as the base for all of the devices. 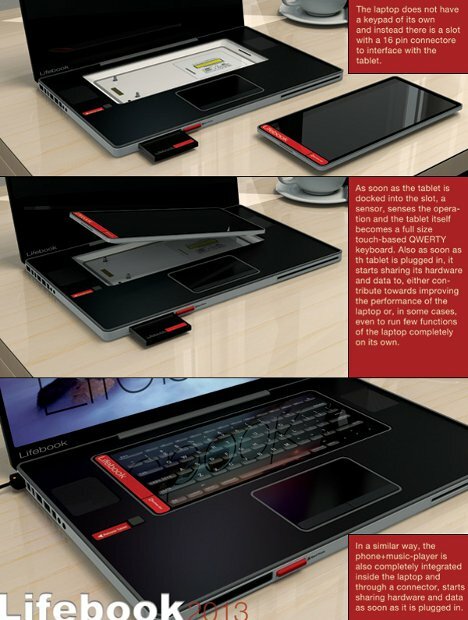 There is no physical keyboard; rather, a touch keypad appears whenever the tablet is plugged into the laptop base. The phone/music player is fully integrated into the laptop as well, and all of the devices share memory and data as soon as they are plugged in. In addition to streamlining the process of storing and transferring data between devices, the Lifebook concept would allow users to charge all of their devices in one place without that huge, ugly tangle of cords we all hate. 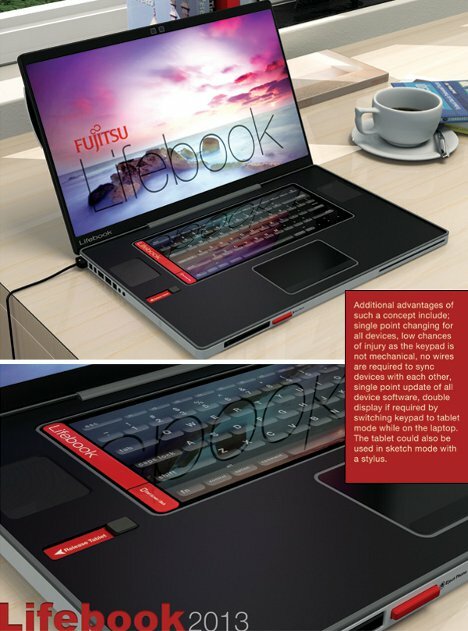 Although the Lifebook is still in the concept stage at the moment, it is not hard to imagine it becoming an indispensable piece of technology in the foreseeable future.